Dredge stewing beef in flour and brown all meat in large frying pan with oil. Sprinkle one half of the chili powder, cumin, oregano, pepper flakes and jalapeno powder over browning meat. In large Dutch oven or soup pot, add diced tomato, tomato paste, bullion, water, cider, sugar and remainder of spices. Bring to boil then reduce heat to low. Sauté onions and garlic until soft and translucent and add to soup pot. Add spiced meat to pot. Cook on medium heat for 30 minutes, stirring frequently. Turn to simmer and cook for minimum 2 hours. Stir chili frequently so meat doesn’t stick to bottom of pot and burn. Add corn flour and water mixture to chili during the last thirty minutes if chili needs thickening. Add salt and pepper to taste. Important: Stir pot especially during last half hour so flour doesn’t stick to bottom of pan. 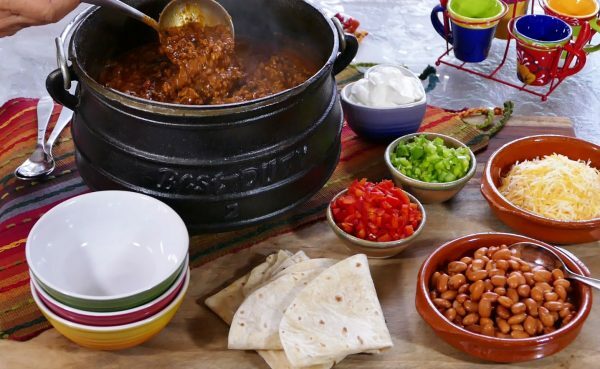 Serve with bowls of heated beans, cheese, chopped green and red peppers, sour cream and flour tortillas. You can read more about how Jack created the Food Network in his book, The Least Likely to Succeed.